So what does the author of The House That Cleans Itself reach for when she wants to read about housekeeping? I'm glad you asked! Starting this week, I'll be profiling some of my favorite authors who write about cleaning with the same “out of the box”-type thinking that my book—and this blog—have always encouraged. Julie Morgenstern. 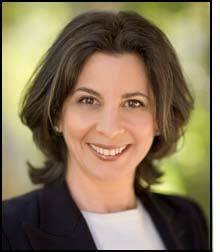 Julie is an organizing and time management expert -- not to mention a New York Times bestselling author. She has spent the last 20 years helping individuals and companies get organized and function smoothly. 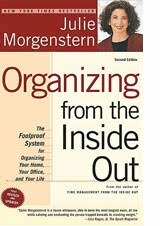 The first book of Julie’s I ever ran across was Organizing from the Inside Out . The advice in that book is quite unique and really resonated with my housekeeping-challenged brain. If you’d like to enhance your House That Cleans Itself approach to housekeeping with some helpful supplementary material, I strongly recommend you give this book a read. 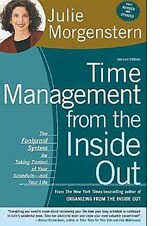 I also once ran across a DVD of Julie’s at the library, called Time Management from the Inside Out . I took it home and watched it and really loved what she had to say there as well. Time management is an ongoing challenge for me, so while this wasn’t exactly a final solution for my struggles with time, it did lead me to ask myself some good questions and help me to re-focus my priorities. In this book, Julie explains how to use her four-step process SHED: Separate treasures, Heave the rest, Embrace identity from within, and Drive yourself forward. 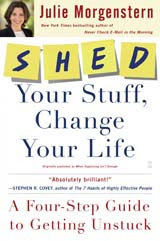 This looks like a good book for all of us who have emotional connections to our stuff but want to overcome the clutter piles once and for all! This one is for all of us working women (and men) who want to take control of our fast-paced workdays, but keep a balance between work and life. Julie gives innovative, easy-to-implement tips about improving performance and efficiency on the job. 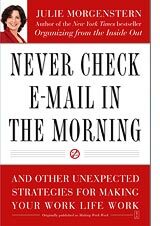 Not checking email in the morning (or at least for the first hour of work) is just the start. She also covers the dangers of multi-tasking, how to trust yourself and your skills, how to refuel by doing what you really love, and much more. 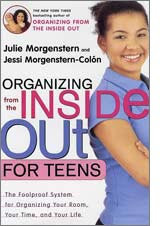 I always thought it would be wonderful to co-write a book with one of my daughters, and that’s just what Julie and her daughter Jessi have done in this teenage-version of Organizing from the Inside Out. Rather than messy homes and offices, this book focuses on messy bedrooms, backpacks, and cluttered social calendars. If your middle- or high-schooler needs practical advice about getting organized or managing their space and time, this sounds like the book for them. Jessi makes the process fun by adding her own comments and experiences. I should have picked this book up for my girls when they were teenagers! And there you have it, recommended reading for the housekeeping impaired. as “Messie” for a reason! Wow, Thanks for listing Julie Morganstern's SHED steps. Those sound so useful. I am looking at two rooms I need to declutter today. I think Julie's plan will help. Thank you.